Find hotel near Basilica De Nuestra Senor ..
Basilica de Nuestra Senora del Pilar is one of the most prominent churches, not only in the city but in the country as well. This beautiful basilica is located in the centre of Zaragoza and boasts of beautiful architecture, built in famous baroque style of 17th century. 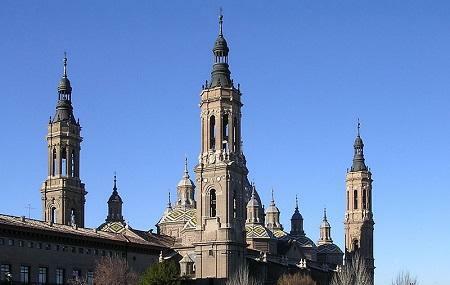 There are 11 cupolas accompanied by four lovely towers reaching up to the sky, giving off a magnamous effect. Experience the magnificence of the place traversing through its nine dome-topped chapels and admire how beautifully each and every piece come together. The artwork used in its establishment was sculpted by the very famous, Francisco Goya, which compels one to stop by and admire the place. Click some pictures or enjoy amazing views of the city from the highest point of it. Ensure to check out the prized ‘Our Lady of the Pillar’ statue while you are at it. The famous figure is what this place has been named upon! Amazing architecture and great ambient no so sad like others cathedrals. Beautiful outside and inside. Full of great details everywhere. Beautiful inside and out. Love the tiles on the roof. The interior is also very nice and worth a walk through. It was free to enter BUT you cannot take pictures inside. Such an amazing place! Totally worth the visit. Go early in the morning.. Opens 8am. The crowds are virtually not arrived yet. You have whole place to yourselves. And the neat part is.. It's totally free! Impressive Basilica. No charge for entrance. Mass, baptism and other services ongoing. Be respectful and no photos inside.